Londoners, unite! Our jampots need us. Marmalade, the sticky stuff that gels our country’s identity together, is in danger of extinction. Only we can save it. Shockingly, a recent report from market analyst TNS, reveals that sales of marmalade have dropped by 4.4% in the past year whilst sales of honey and jam are on the increase. Apparently the sappy youfs of England can’t handle the tang of marmalade and crave the instant sugary hit of jam. Lord, preserve us! Luckily Seville oranges are in season so you can do your bit for marmalade conservation. Get yourself down to Borough market – quickly, before the developers come along and destroy the place (more on this later) - pick up a cartload (they are incredibly cheap right now) and immerse yourself in a citrus fug on a Sunday afternoon. Below is an easy recipe for simple, but delicious, basic marmalade. 1. Cut the oranges and the lemon in half and squeeze out the juice. Put the pips and as much of the membrane as you can scrape off into the muslin square. Tie the muslin into a ball with string. 2. Slice the peel (use a Foodaid or Magimix to save time) as coarsely or finely as you like and put into the pan with the juice and three pints of water. 3. Suspend the bag of pips in the liquid and tie to a pan handle so you can remove it later without scalding yourself. Bring the mixture to the boil and simmer for 1 – 1½ hours until the liquid has reduced by half. 4. Warm the unwrapped packets of sugar in the oven on a low temperature which helps the sugar crystals to dissolve quicker and put the clean jam jars in at the same time to sterilize them. And pop a couple of saucers into the freezer – these will be important later. 5. Fish out the muslin bag and squeeze as much liquid as possible back into the pan. 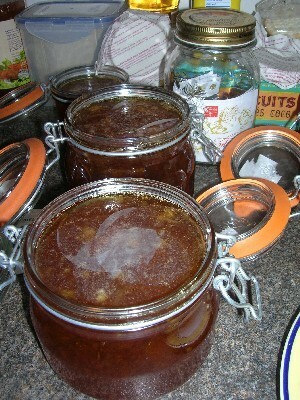 The pips contain pectin which is essential for making the marmalade set so this step is important. Otherwise you will have made several jars of orange soup. 6. Stir the sugar into the pan until it has dissolved and boil hard for 15 minutes. To test to see if the marmalade has reached setting point, take a saucer out of the freezer and plop a blob of marmalade onto it. If the mixture wrinkles and holds its shape when you push your fingertip through it, then it’s ready. If not, continue to boil and try again. 7. When ready, leave the marmalade to stand for 10 minutes and then bottle into the jars, placing a wax disc on top of each jar to prevent mould from forming on the surface. Try to resist eating for at least a month whilst the flavours mature and develop. And in the meantime show your support for the Save Our Marmalade campaign by voting for it as an English icon here.